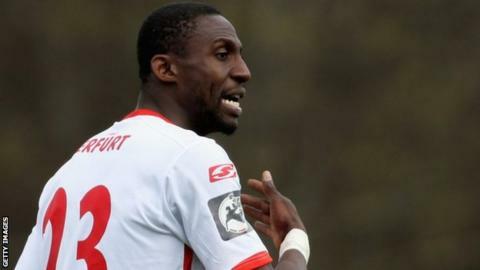 Manchester City midfielder Yaya Toure has led tributes to compatriot and former Ivory Coast defender Steve Gohouri who died at the age of 34. The ex-Wigan player went missing on 12 December after a Christmas party with his German club TSV Steinbach. German police confirmed his body had been found in the River Rhine in the western city of Krefeld on Thursday. "My thoughts and prayers are with the family of Steve Gohouri. Very sad news he is no longer with us," Toure said. Police added that there were no suspicious circumstances surrounding his death. Another current Ivory Coast international, Hertha Berlin's Salomon Kalou, has paid tribute on social media. "Rest in peace my brother," he wrote. Gohouri, a member of the Ivory Coast 2008 African Cup of Nations and 2010 World Cup squads, moved from his native country to France at the age of five, where he was raised in the suburbs of Paris. Former Ivory Coast captain Didier Drogba, who played alongside the defender for the Elephants, described him as a 'soldier'. "So sad about this news, lost one of my soldiers, Cote d'Ivoire lost one of his most loyal sons. My thoughts goes to the family. R.I.P. Bro (sic)," Drogba wrote. Gohouri began his football career in France but played for clubs in Israel, Switzerland, Liechtenstein, Greece and Germany. He played for German side Borussia Mönchengladbach between 2007 and 2009, helping the club gain promotion to the Bundesliga in 2008. Gohouri moved from Germany to then-Premier League side Wigan in January 2010 where he made 42 appearances for the club between 2010 and 2012. His former club Borussia Monchengladbach tweeted: "Borussia are mourning the loss of Steve Gohouri. Our thoughts and prayers are with his friends and family." "This is terrible news," Mönchengladbach sporting director Max Eberl said. "I got to know Steve as a person full of the joys of life and that's how I'll remember him. Our thoughts and sympathies are now with his family." The club's Guinean international winger Ibrahima Traore wrote: "RIP my brother Steve gohouri. No Word for such a drama." Gohouri joined Maccabi Tel Aviv in the summer of 2012 and also had a spell at Skoda Xanthi in the Greek top flight before looking to finish his playing career in the fourth-tier of Germany. He joined TSV Steinbach from Erfurt in 2015.